Mitigating any remaining buffering, and spectral inversion issues some of you may be experiencing. Increasing the baud rate of the UART bridge, which is the link that is used to communicate with the LMS and Si5338 through the Nios core. The new baud rate is 4Mbps, which is up from 115kbps so dumping registers on the CLI, changing channels and others configurations in UIs like GNURadio and OsmoSDR is now much faster. Adding hardware accelerated IQ correction. This HDL based DSP coprocessor corrects for magnitude and phase imbalances right as the samples are captured. 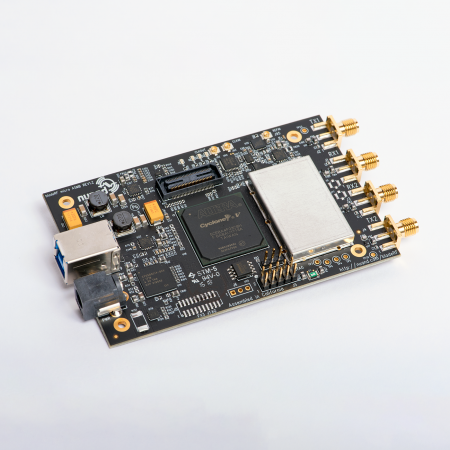 The core greatly lessens the computational load on small embedded devices that still want to operate in entirely embedded environments (be it a RaspberryPi or the onboard FX3) and still achieve great system SNR. Acquiring parts for the mass production of the transverter boards. We have made some changes to the system performance that should greatly improve some of the RF characteristics of the expansion board. We will confirm these new specifications once we are sure that all new boards are capable of comfortably achieving them. If you have any questions or concerns about an order you placed that contained a HF/VHF transverter board please send an email to us at bladeRF@nuand.com . The OpenBTS branch (https://github.com/nuand/bladerf/tree/dev-openbts) adds timed RX and TX capabilities to bladeRF’s HDL through a metadata interface. The metadata packet format also allows for the development of drop-in HDL based modulators and encoders/decoders. More on this, and full instructions for OpenBTS in early January. PS. We would like to thank Ben for adding bladeRF support to OpenLTE ( http://openlte.sourceforge.net/ )! Hope everyone has a happy new year!